Last night's game showed us exactly what the Pirates are lacking. In an attempt to produce some offense, Jim Tracy started Xavier Nady in center, which allowed Ryan Doumit to play right. With two outs in the 6th inning, Chipper Jones drove a ball to deep center field. 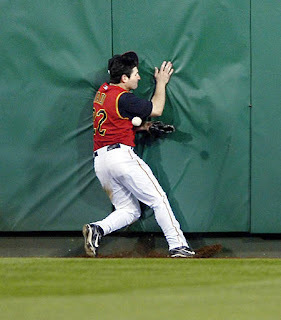 Nady made an excellent effort at a tough catch, but the ball popped out of his glove when he slammed into the wall. A catch there could have ended the inning. Instead, the Braves scored four runs and went on to win 4-1. Now I am not faulting Nady for being unable to make this play. As I stated before, this was a difficult catch. But when you compare it to the catch made by Andruw Jones earlier in the game, it is clear why the Pirates are 15-19 and the Braves are 23-12. This was just one example of a play that was not quite made by a Pirate. Over the course of a season (or 14 seasons), those plays add up to equal losing baseball. Duffy probably makes this catch because of his superior speed. He could have been to the warning track just a split second earlier than Nady, which means he would not have needed to slam into the wall as hard while attempting a catch. But Duffy was on the bench, as the Pirates desperately looked for ways to produce some runs. His .299 OBP at the top of the order was not helping the team. So what do you do? Do you sacrifice offense for defense? Or do you force your best hitters into the lineup, regardless of the impact on the defense? It's a lose-lose situation for the Pirates right now. By the way, the offense came back to earth after its "monstrous" six-run output on Thursday afternoon. Kyle Davies, who came into the game with an ERA over 6 and a WHIP of 1.69, held the Bucs to one run on seven hits over seven innings. I think I've heard this story before, the one where the struggling pitcher has an easy night against the Pirates' punchless lineup.